Whether your half term fell last week or this week and covers Halloween. One thing is for sure you'll want to keep the kids entertained. Our half term fell last week and over the course of that week and during the afternoons this week the products within this kit have been put into use. Following on from the girls summer car kits I decided to put together a kit for Halloween. 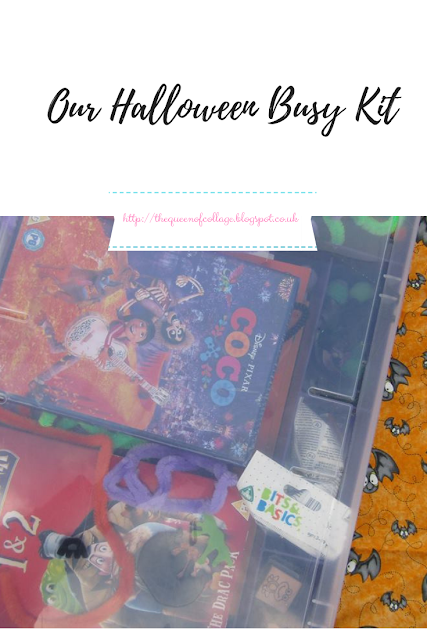 I wasn't sure at first when I should give the girls the kit but it made sense to use it during half term and in the run up to Halloween. So what did my girls discover in the kit? 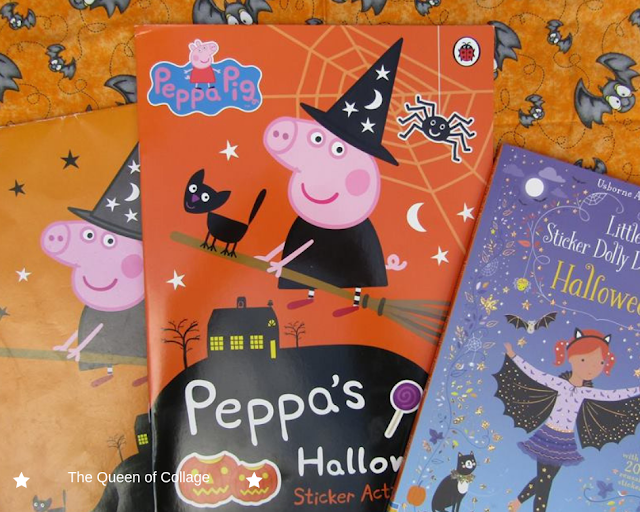 Halloween themed activity books picked up from the shelves of supermarkets for a smidgen of the price that they would be brand new in other shops. I decided to pick up an Usborne sticker book from one and a Peppa Pig one from another. I also have to hand a Peppa Pig colouring book that was picked up last year in Poundland and has barely been touched. 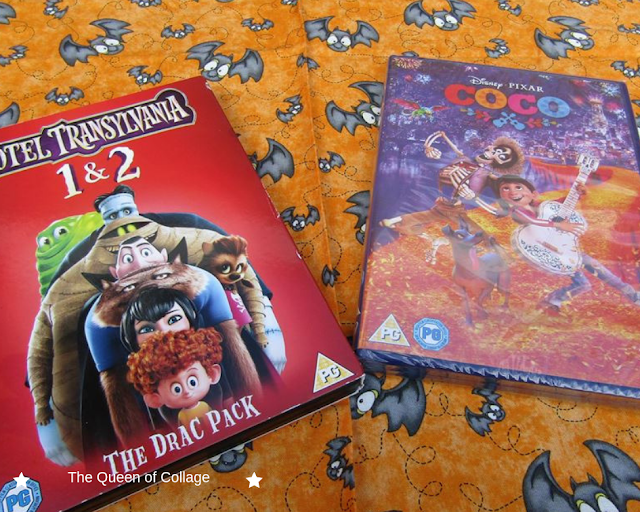 Depending on where you are headed over the half term a couple of dvds may be the ticket to giving you 5 minutes peace from the kids while you catch up with loved ones. We've still yet to watch these dvds and if we don't get around to them this year we can always watch them next year when the girls are older. loved feeling but I felt it was rather like touching jelly.I also managed to squeeze in pipe cleaners, rubber stamps and gold stars. These too have yet to be used. The star of the show by far was possibly all the activities I downloaded from the internet. These preschool activities came from 3 Dinosaurs, Over the Big Moon and Tot Schooling. These free to download printables kept eldest entertained for hours. Do you think kits like this are a good idea? 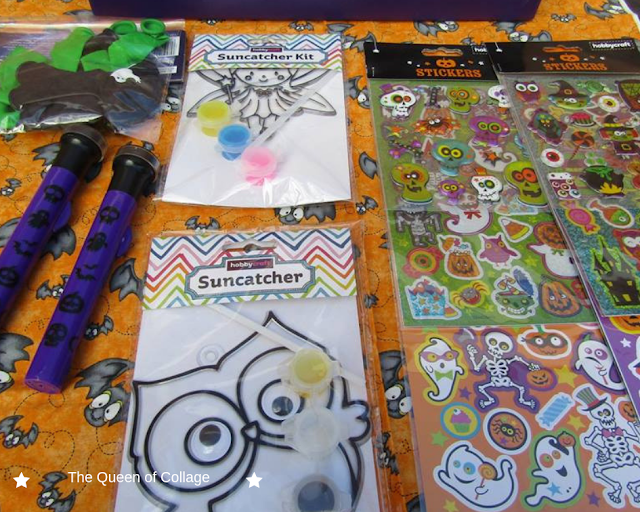 Have you put together one of your own or perhaps you've created a Halloween hamper. Do let us know in the comments below. We love reading them.